Go to http://www.eclipse.org/downloads/ and download Eclipse Classic (the latest version is 3.7.1). After downloading, install and verify that it can run. Note: If there is any error, check the System Requirements. In particular, you might need to install the JDK. Go to http://developer.android.com/sdk/index.html and download the Android SDK package. For Mac and Linux users, download the zip/tgz package and unpack it to a safe location. The SDK files will be unpacked into a directory named _android-sdk-_. Proceed to step (3). For Windows users, download the .exe package, and run it to install. 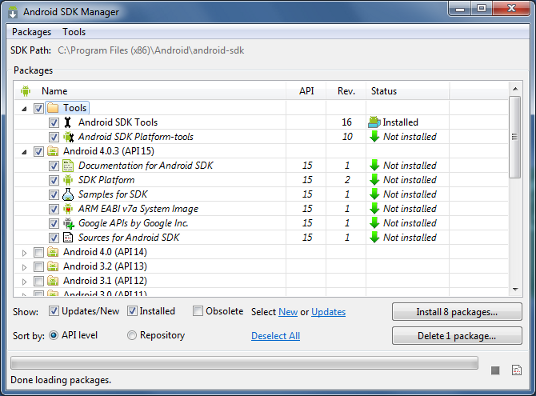 After installation is complete, the installation wizard will launch the Android SDK and AVD Manager. There is a slight inconsistent behaviour for Windows users here. Go to step (4) first, and return back to step (3) after you have finish step (4). Start Eclipse, select Help > Install New Software. Click Add. **https://dl-ssl.google.com/android/eclipse/**   3. Click **OK**   4. Click **Next, **Next**, **Next****.. and **Finish**   5. When the installation completes, restart Eclipse. 6. In Eclipse, select **Window** > **Preferences** (Mac OS X: **Eclipse** > **Preferences**). 7. Select **Android** from the left panel. 8. For the _SDK Location_ in the main panel, click **Browse** and locate your downloaded SDK directory. 9. Click **Apply**, then **OK**. The Android SDK uses a modular structure that separates the major parts of the SDK. Specifically, the different versions of Android OS are each a module. To develop for a particular version, you would need to add the platform for that version. To do so, from within Eclipse, select Window > Android SDK and AVD Manager. Go to Available Packages, and select at least 1 platform. You may select additional platforms if you require. Click Install Selected to download and install. Done!